The chance to get up close and personal with an apparition is an opportunity of a lifetime. In order to see an apparition, one has to be in the right place at the right time and getting one’s hands on one of these haunts can be a trick. Abandoned buildings are legally off-limits, not to mention dangerous. Unless one is a paranormal investigator, one’s prospects of finding a haunted inn can be slim because one just doesn’t have the connections. Well, I'm going to help you change that. In this section are a list of hotels researched by me AND the tales of those who have visited haunted hotels. The hotels I research are reportedly haunted and the properties will welcome you, allowing you to experience a most haunted location for yourself. Many of these hotels on my list encourage or even host investigations so you may even be able to secure a room where paranormal activity has been known to exist. No more sneaking around treacherous areas where you can be hurt. No more breaking the law. Rent a room and soak up all the spooky amenities. Stay up all night gathering evidence – be polite, don’t disturb the other guests and you may have carte blanche to get EVP, photo evidence and video. Below my list are the stories of those who witnessed a haunting at a hotel. It may be a famous hotel, possibly from my list, or one I haven't yet researched. As visitors submit their evidence and stories, I will be posting those accounts here. Why are hotels such paranormal hotspots? Because hotels are like houses - people live their lives there. Thing is, a because so many come and go, hotels contain a lot more lives than a house, which creates a bigger opportunity for energies to build up. Heck, back in the day, many people even resided permanently in hotels. Lots of human emotion occurs within hotel walls and many life events are experienced there - weddings, births, merriment, celebration, break-ups, illnesses, personal tragedy, etc. - the kind of emotional events hauntings are made of. Just think what this could mean for you and your ghost hunting friends. These are places where you may be able to experiment with your equipment, gather your own evidence and maybe – just maybe – encounter an apparition of your own. On the other hand, you could leave your gear at home and treat yourself to a wonderful getaway. Have a great meal, some good drinks and just enjoy yourself! Even if you can’t visit one of these haunted hotels, it’s great to learn the history and the stories behind them. Have you ever noticed that a large part of ghost hunting is becoming a bit of an historian? Not only is it a thrill, it’s educational, too. So kick bank, dust off your history books and enjoy what I love presenting - a list of delightful, yet eerie, haunted hotels. And to those lucky enough to visit them: have a wonderful and safe trip. Please keep us posted as to your findings. Have you stayed at a haunted hotel? Did you witness anything peculiar . . . or haunted? We want to hear about it. Place your cursor in the white box below and send us the details of your stay and upload your photos, too. This is one place where orbs are allowed, but make sure you fill us in on what occurred. Did you feel a presence? Did you check to make sure there wasn't a reasonable explanation? Please provide all details so our visitors can see for themselves if they want to visit, too. 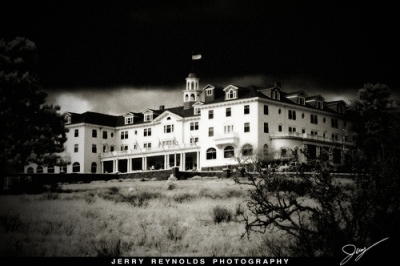 Click below to read about people who have stayed in a haunted hotel and what they experienced. Below is the email I wrote to the email address on the Whaley house website. My ex husband and I stayed in room #401 at the Stanley and got what we bargained for! 1) As with many old hotels, entities who enjoyed the hotel while alive have decided to make this glorious hotel their after-life home. The story of an historical hotel in Ohio is featured in this video. It is featured on True Ghost Stories from Ohio Volume 2. Pretty creepy stuff.